I'm not a party animal - gone are the days when I used to live for the weekend and make an appearance at clubs ready to dance the night away and wash down my dinner with shots and cheap drinks. No, I love my early mornings - waking up at dawn when everything around me is so quiet, and everyone else in the house is still asleep, there's something so peaceful and happy in that moment. But I can't handle my early mornings without having enough sleep - but sometimes it's inevitable. Photo shoots and video shoots sometimes roll into the evening and travelling from location can take hours, meaning my head hits the pillow late at night; working on campaigns with tight deadlines means that I often end up working into the hours of the night; and attending exciting brand events means I know I won't be home until nearly midnight! So dark circles and bags under my eyes make an appearance on my face more often than I would like them to. I have been using It's Potent! from Benefit for a number of years, sometimes wondering away from it when trialling a product for my blog. 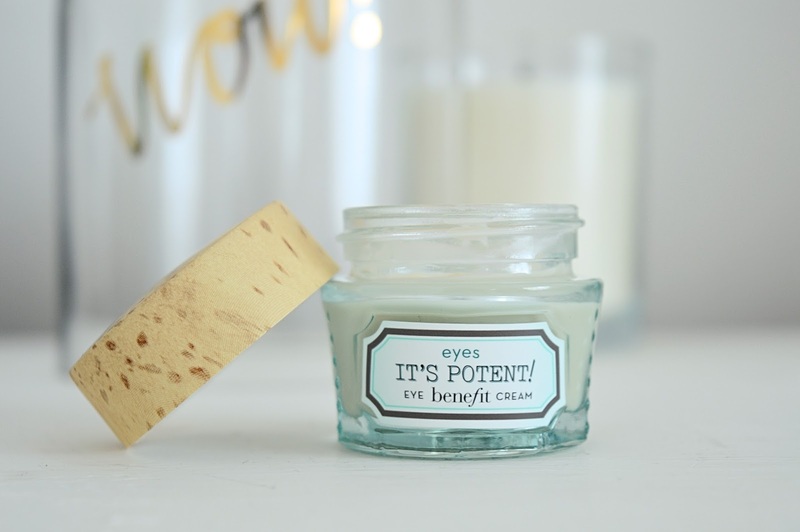 I really enjoy using this eye cream which is why I thought I would tell you guys about it - this isn't a brand sample or a Benefit plug, but rather a product which sits on my bathroom shelf and makes my mornings a little more pleasant. It's Potent! has a moisturising effect which tackles tired eyes - apply a little bit under the eye in the morning for quick results. It's developed so it works well with concealer on top, really helping to cover up dark circles. The only thing that puts me off this product is the fact that it does contain chemicals rather than natural ingredients, and I try and use skincare which is more natural because I think it's generally better to use organic/natural products wherever you can. It's not as damaging as chemicals, which sadly It's Potent! does contain. I would also have to point out that reading other reviews, some people have had reactions to this creme so make sure you test it a little before you smother it on your eyes. Have you tried It's Potent! Eye Cream from Benefit? What do you think? And if you know of a more natural but effective eye cream please let me know! I'd love to find something which works as well, but has more natural ingredients.